Mainly Maine: Do lobsters like motivational speakers? I loved it… It was a great group, and a fun day. It was amazing (and a weird coincidence) to be back in Maine; I was a speaker there just a few months ago. 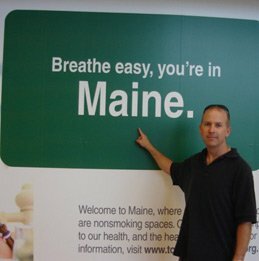 I had worked in 49 of the 50 states until I finally got to work in Maine. And then, BAM, I’m back again. He just laughed and did it. Bonus? I got to have a lobster roll from a road-side fish shack. Very touristy! Yum! Need a motivational humorist speaker to visit your company or association? Visit my Official Website here. Motivational Keynote Speaker, Humor Expert, Lover of Maine! https://www.bradmontgomery.com/wp-content/uploads/2018/11/logo-1-495x198-1-300x120.png 0 0 admin https://www.bradmontgomery.com/wp-content/uploads/2018/11/logo-1-495x198-1-300x120.png admin2006-07-21 05:13:462006-07-21 05:13:46Mainly Maine: Do lobsters like motivational speakers? Want to Be Funny? Hang with Funny People! Should you be working? Try this….